'Cleanliness is next to Godliness' is what is taught to all the children in their primary school. As we grow up we tend to forget majority of the childhood lessons. It's not the sole mistake of people alone. Anything that lacks revision or reinforcement has higher probability to be forgotten. This being the case, we need constant reminders about the rules and regulations to follow that shall protect the ecosystem that we exist, live and thrive in. Maintaining a clean and hygienic environment is one of the keys for a better and healthy lifestyle. Being the second most populated country, India definitely faces the challenges of handholding a huge population to follow the laws to maintain a clean environment. Being the most dynamic Prime Minister who he is, Shri Naredra Modi ji has taken up this prominent challenge to evolve a clean India and has launched the Mission Swachh Bharat. The Prime Minister, Shri Narendra Modi has said that Mission Swachh Bharat should become agenda of entire country, in the form of a mass movement to be launched on October 2nd, with an aim of creating a clean India by 2019. The Prime Minister was chairing a high-level meeting to review preparations for the launch of Mission Swachh Bharat. Shri Narendra Modi has said the activities on October 2nd should not be limited to the Prime Minister's functions in the national capital. Activities related to cleanliness should be undertaken in each and every village across the country, highlighting the need for working together with State Governments to make this Mission a success. 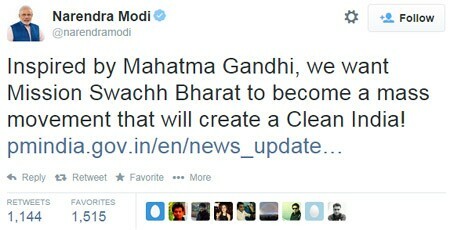 Gandhiji should be our inspiration for Swachh Bharat. The Prime Minister highlighted the need for creating a legal architecture that would institutionalize Mission Swachh Bharat at all levels, up to the village level. He asked the Ministry of Rural Development to explore the possibility of incentivizing best performing villages. He also called for standards of cleanliness to be established for Government offices. The Prime Minister underlined the importance of creating specific roles for various public representatives, including MPs, MLAs, Sarpanches etc. Various Union Ministries, including the Ministries of Urban Development, Rural Development, Human Resource Development and Information & Broadcasting, have presented their concepts on the Mission. Towns along river bank of the Ganga and its tributaries will be accorded top priority in Mission Swachh Bharat. India has already made news in the foreign dailies and movies about the lack of cleanliness that's prevalent in our country. It's time to rewrite the history with this historic mission of Swachh Bharat. The government backing up the mission is a huge impetus for crores of Indians to do their small bit towards a cleaner India. IUemag urges every citizen of not just India but the entire mankind to take up his/her basic initiative to maintain the small environment that s/he lives and travels in clean so that the future generations can concentrate their energies and focus on achieving bigger goals in a clean environment.